Lantana montevidensis growing creeping or subshrub‎ of the genus Lantana also known as Trailing lantana, Lantana montevidensis perennial evergreen in frost become deciduous used as ornamental plant, can grow in tropic, mediterranean, subtropics or temperate climate and growing in hardiness zone 5+. Leaves color green in elliptic shape in size 2-4 cm, the touch is unpleasant the plant has thorns. When is the best time to prune a Lantana montevidensis shrub? 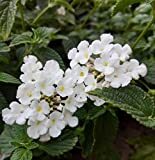 What is the size of a Lantana montevidensis shrub?